Vicente del Bosque turned down the chance to succeed David Moyes as Manchester United manager and was offered the job before Louis van Gaal, according to reports in the Spanish press. The veteran Spain boss was nominated as the first-choice replacement for the sacked Scot by Sir Alex Ferguson and the Red Devils made their approach in April, according to AS. But the 63-year-old former Real Madrid boss reportedly would not even consider talking to the club, and instead has signed a new deal to extend his time in charge of the Spanish national team until after Euro 2016. United have since confirmed that Van Gaal will be their new boss following the World Cup in Brazil this summer. But AS also report that the Dutchman was only one of three names on United’s shortlist, along with Del Bosque and Atletico Madrid manager Diego Simeone. 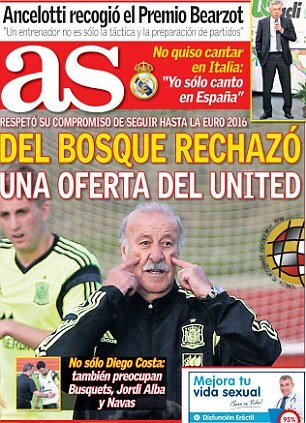 Del Bosque could have made vastly more money by taking charge of United, but apparently refused even to entertain the approach. Madrid president Florentino Perez had claimed on Tuesday that Manchester United wanted Carlo Ancelotti to take over from Ferguson last year. Speaking on Spanish radio, Perez suggested Ferguson only chose Moyes after Ancelotti told him he was replacing Jose Mourinho at the Bernabeu. Meanwhile, Mundo Deportivo are reporting that Barcelona have offered Paris Saint-Germain £16million plus Dani Alves for Marquinhos. The super-rich French club, who are set to sign David Luiz from Chelsea in a huge deal, have reportedly rebuffed the offer and instead want £24.5m plus Alves before they consider a deal for the 20-year-old Brazilian centre-half. 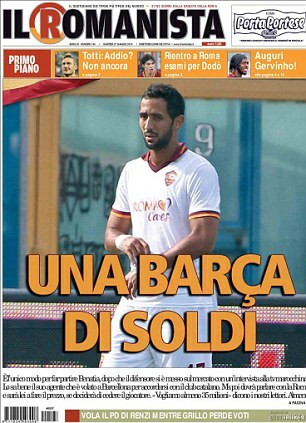 Barcelona have also been told they will need to splash out for Roma defender Mehdi Benatia. The Moroccan defender had a hugely impressive debut season as Roma finished second in Serie A and has attracted interested from Barca, Manchester City and United. But Roma have told any potential suitors that the 27-year-old will cost them £32m, according to Italian daily Il Romanista. 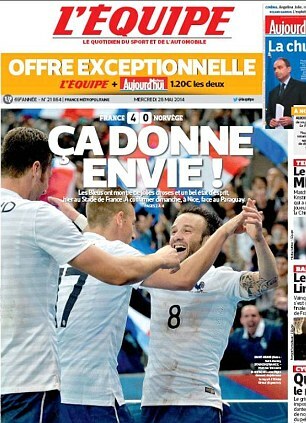 In France, L’Equipe hailed Les Bleus’ 4-0 friendly win over Norway as ‘giving life’ to the national side’s World Cup campaign. Olivier Giroud scored twice, while Loic Remy and Paul Pogba also found the net as Didier Deschamps’ men saw off the Norwegians with ease. And the result has seemingly left France upbeat ahead of the tournament in Brazil.